Soil is more than just dirt. Nutrients, pH, and soil texture all determine the success of gardens and lawns. If you are serious about growing the best lawn, shrubs, perennials, or vegetables, the place to start is with the soil. Soil isn't just dirt that holds a plant in place; soil contains the macro- and micro-nutrients necessary for plant success. The major nutrients necessary for plant growth are nitrogen (N), phosphorus (P), and potassium (K). The composition and pH of soil affect the availability of those nutrients to plants. Soil pH ranges from acidic (pH value below 7), neutral (a value of 7) to alkaline (pH value above 7). Soil is composed of varying proportions of mineral clay, sand, or silt particles, and the relative levels of each determine the soil texture and moisture-holding capacity. The first step in your journey to better soil is a better understanding of your current soil conditions. A soil test will give you answers about the nutrient levels and pH level of your soil, as well as its textural composition. Your local state university extension office is the best place to find soil-testing agencies in your area. When you submit soil samples, you typically specify what you want to grow in the area being tested. The test results usually come with an interpretation that provides guidelines for soil amendments in terms of pounds of amending material per 10, 100 or 1000 square feet. In general, all yards and gardens benefit from the application of compost. Compost is organic (carbon-based) plant material that has been partly or totally decayed. A mulching mower that shreds grass and leaves into small pieces is the simplest method of continuously adding organic matter to your lawn, since it quickly breaks down in nutritious material. 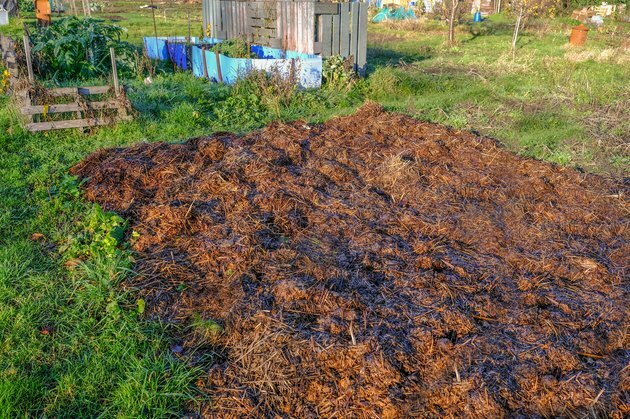 Animal manure (from cows, horses, rabbits or chickens) and vegetable scraps that have been composted for at least one year contain nitrogen, phosphorus, and potassium as well as organic material. If you don't have your own compost pile, you can purchase commercial compost either in bulk or bags. For the best quality compost, seek out suppliers bearing the US Composting Council Seal of Testing Assurance. This compost is completely composted and tested for undesirable contents such as dyes, construction waste, and residues from herbicides and pesticides. You can add uncomposted manure and bedding to garden beds in the fall. Every fall, spread 1/4 to 1/2 inch of compost over the entire lawn using a rake. For new garden beds or shrub or tree planting, turn over 3 to 6 inches of compost into the top 8 to 12 inches of soil. Every year add 3 to 4 inches of compost around established plants. This has the added benefit as acting as mulch to retain moisture, cool the soil, and inhibit weeds. Plant-based mulches such as wood chips and bark also add organic material to the soil, but because of their high carbon content, they may pull nitrogen out. In general, amending the soil with phosphorus or potassium should only be done if soil testing shows a deficiency. Because of the stress applied to lawns—high traffic, mowing—fertilizer containing nitrogen is typically used on an annual basis for turf grass. 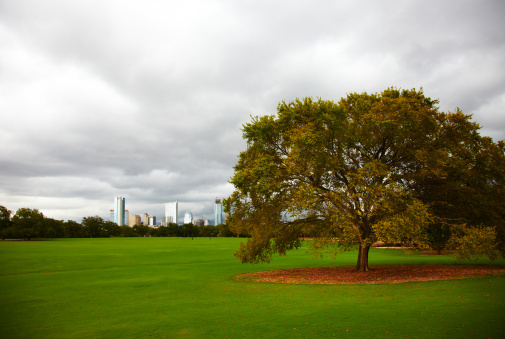 The amount needed varies based on whether lawns are irrigated, whether the grass clippings are removed or allowed to remain, and the type of grass and local climate. Application rates for nitrogen range from 0.5 pounds per 1000 square feet to 4 pounds per 1000 square feet. 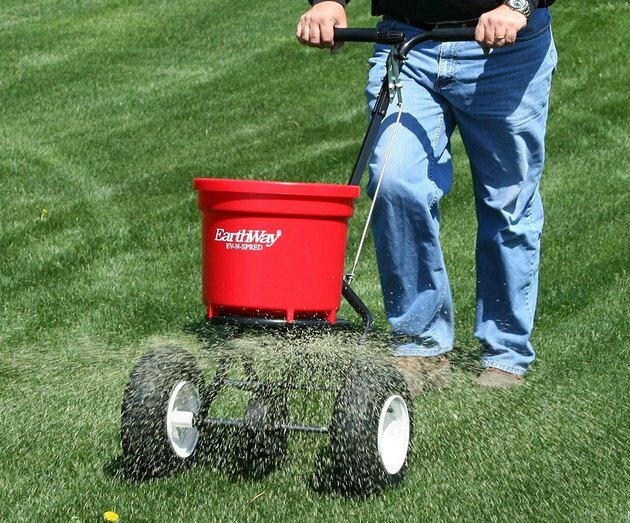 Use a rotary (shown) or drop spreader to apply fertilizer and other lawn amendments. For trees and shrubs, incorporate phosphorous and potassium in the planting hole as needed. Again, soil testing will determine what is needed based on the current nutrients and the soil composition. Nitrogen applications should be based on the soil composition. Over-application of nitrogen in soils with low levels of organic material can deplete the soil. Excess nitrogen can also contaminate surface and groundwater. Use a drop spreader or rotary spreader to apply nitrogen-based fertilizers to lawns during the growing season. 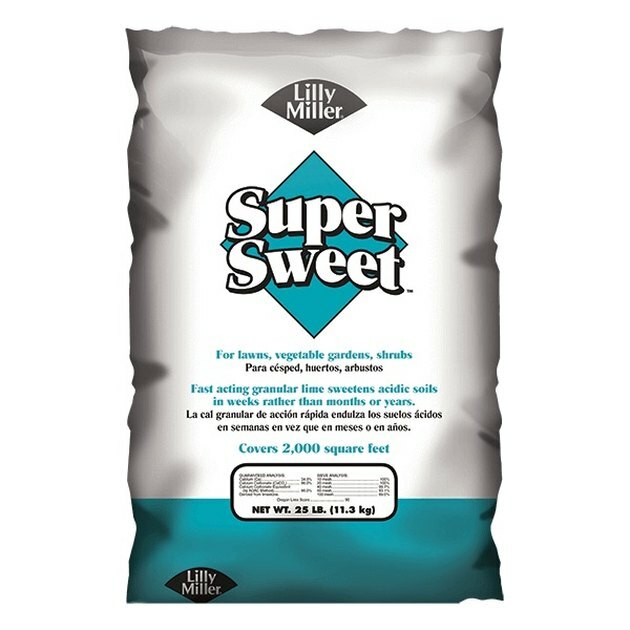 Nitrogen fertilizers are available as quick-release or slow-release formulations. Slow release fertilizers are less likely to cause surface damage to grass blades, and less likely to produce a striped effect in your lawn due to poor application technique. Only apply products according to package directions and locally determined need. Too much fertilizer is more damaging to plants than too little fertilizer. Beware of fertilizers that also contain pesticides or herbicides. It is best to spot-treat weeds, and insecticides should only be used if a proven infestation is occurring. Overtreatment with pesticides destroys the soil processes that produce healthy soil. Changing the acidity (pH below 7) or alkalinity (pH above 7) of soil over large areas such as a lawn is time-consuming—it may take years. Making soil more alkaline (less acid) requires an application of limestone or wood ash. Making the soil more acidic (less alkaline) requires the application of sulfur-based products. The amount of lime or sulfur needed depends on the change desired and the textural makeup of the soil. The proportion of clay, sand, and silt in the soil strongly affects the amounts needed. Some alkaline soils are highly resistant to pH changes. For growing turf grasses, the best time to amend soil pH is prior to planting. If applying to an established lawn, do not apply while the lawn is dormant. In cool climates, the grass is dormant during the hot summer months and in winter. In warm climates, the grass is dormant during the cooler months. Liming agents come in a variety of forms. Pelletized or granular lime is easier to apply. To apply lime or sulfur amendments to lawns, always test first, always apply during the growing season, and always apply according to package instructions. Begin by aerating the lawn, which will allow the amendments to be absorbed more quickly. Use a drop spreader or rotary spreader and apply half the needed amendment in a north-south direction. Apply the other half in an east-west direction. This allows for the best, most uniform coverage. Some amendments require watering after application. In garden beds, it is generally most effective to plant species that are adapted to your local soil pH. However, if you want to have certain plants, it is possible to create islands of acidity or alkalinity. For example, if you want to grow acid-loving azaleas or blueberries in an area of alkaline soil, you can plant the shrubs directly in sphagnum moss, mulch with pine needles, and/or fertilize annually with an acidifying fertilizer. In some instances, you might find it most cost-effective to "skin" your yard and bring in new topsoil. It is common in home construction to remove the existing topsoil and sell it elsewhere. The subsoil in many areas is less than desirable for lawn or gardening. Of course, before bringing in any new topsoil, have it tested to assure it is within the desired range. For garden beds, using raised beds or berms allows you to create exactly the soil conditions desired for planting areas. I love to garden and make "furniture" for the garden. Welded metal archways, salvaged wooden gates, and a variety of modified pots decorate my fully shaded northern yard.